Ladies Womens 14k Two-Tone Gold 4mm Polished Open Link Bracelet 7.25"
ITALY 925 Sterling Silver FIGARO Chain NECKLACE-BRACELET-ANKLET-1.4mm~9mm-7"~30"
925 SOLID STERLING SILVER JEWELRY HANDMADE BRACELET FROM 7.5" TO 8.5 "
Style: ChainLength: 7 - 7.49"
MAIN STONE COLOR Creamy White. PEARL 9.5 MM. FACE BANGLE 62.0 X 24.0 MM. PRODUCT TYPE Bangle. OTHER GEMS Ruby. MAIN STONE Pearl. PLATE 14k White Gold. TOTAL weight 101.70 ct (total weight of silver stone). Sterling silver 925 Bracelet. The weights: 19 gram. PRODUCT TYPE Bangle. FACE BANGLE 64.0 X 13.0 MM. MAIN STONE SHAPE Oval Cut. MAIN STONE COLOR Top Rich Green. PLATE 14k White Gold. TOTAL weight 123.61 ct (total weight of silver stone). IF very high quality & Free from inclushions. October - Opal & Tourmaline November - Topaz & Citrine December - Tanzanite & Turquoise. MAIN STONE Tourmaline. 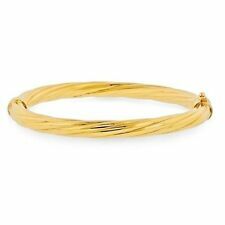 PRODUCT TYPE Bangle. FACE BANGLE 69.0 X 15.0 MM. July - Ruby August - Peridot September - Sapphire. October - Opal & Tourmaline November - Topaz & Citrine December - Tanzanite & Turquoise. MAIN STONE Tourmaline. July - Ruby August - Peridot September - Sapphire. How to find correct size of Bangle. FACE BRACELET 165.0 X 4.0 MM. Ending 23 Apr at 16:29 EDT4d 20hTop Rated SellerFrom ThailandMetal: Sterling SilverStyle: TennisLength: 7.5 - 7.99"
OTHER GEMS Tourmaline. MAIN STONE Black Opal. MAIN STONE COLOR Black With Hot Rainbow Luster. LUSTER Amazing. MAIN STONE SHAPE Oval Cabochon. FACE BRACELET 150.0 X 11.0 MM. PRODUCT TYPE Bracelet. PLATE 14k White Gold. Ending 23 Apr at 16:57 EDT4d 20hTop Rated SellerFrom ThailandMetal: Sterling SilverStyle: TennisLength: 7 - 7.49"
MAIN STONE Aquamarine. CZ 2.0 MM. FACE BRACELET 160.0 X 4.0 MM. PLATE 14k White Gold. MAIN STONE SHAPE Oval Cut. PRODUCT TYPE Bracelet. MAIN STONE COLOR Bright Blue. TOTAL weight 65.80 ct (total weight of silver stone). Ending 23 Apr at 14:56 EDT4d 18hTop Rated SellerFrom ThailandMetal: Sterling SilverStyle: TennisLength: 7 - 7.49"
MAIN STONE Fire Opal. CZ 1.0 MM. FACE BRACELET 176.0 X 3.0 MM. MAIN STONE COLOR White With Hot Rainbow Luster. MAIN STONE SHAPE Oval Cabochon. PRODUCT TYPE Bracelet. ORIGIN Australia. TOTAL weight 50.25 ct (total weight of silver stone). Ending 23 Apr at 15:16 EDT4d 18hTop Rated SellerFrom ThailandMetal: Sterling SilverStyle: TennisLength: 8 - 8.49"
Cable oval Link Bracelet Solid 14K Yellow Gold Onyx jeweled Toggle Clasp 9g. Condition is Pre-owned. Shipped with USPS First Class Package. 16.9 Grams ... No Reserve! October - Opal & Tourmaline November - Topaz & Citrine December - Tanzanite & Turquoise. PLATE Black Rhodium. July - Ruby August - Peridot September - Sapphire. MAIN STONE Sky Blue Topaz. How to find correct size of Bangle. Ending 23 Apr at 19:38 EDT4d 23hTop Rated SellerFrom ThailandMetal: Sterling SilverStyle: TennisLength: 8 - 8.49"
OTHER GEMS Cubic Zirconia. October - Opal & Tourmaline November - Topaz & Citrine December - Tanzanite & Turquoise. MAIN STONE Fire Opal. How to find correct size of Bangle. MAIN STONE SHAPE Oval Cabochon. Ending 23 Apr at 16:42 EDT4d 20hTop Rated SellerFrom ThailandMetal: Sterling SilverStyle: TennisLength: 7.5 - 7.99"
7" x 5.10mm Gold Byzantine Bracelet. 7.75 Grams. 14 kt Rose Gold. New ListingCarved Leaves - Yellow Onyx Gemstone Handmade .925 Silver Bracelet 7-8"
David Yurman 925 Silver Cable Classic Bracelet With Diamonds and Turquoise Item Details: Weight: 28.8 Grams Hallmark: DY 925 Width: 5mm Length: 6 inches Main Stone: Turquoise Size: Medium Retail: $725 This Purchase Includes Free Shipping and the Original David Yurman Gift Pouch! New ListingZebra Jasper Gemstone Handmade .925 Silver Bracelet 7-8"
New ListingChrysocolla Gemstone Handmade .925 Silver Bracelet 7-8"
Sterling Silver Semi-pecious link bracelet 7" long 925 topaz, amethyst .... Condition is Pre-owned. Shipped with USPS First Class Package. CZ 1.0 MM. FACE BRACELET 70.0 X 8.0 MM. MAIN STONE SHAPE Pear Cut. MAIN STONE Ruby. PLATE 14k White Gold. PRODUCT TYPE Bracelet. TOTAL weight 31.31 ct (total weight of silver stone). MAIN STONE COLOR Top Rich Red. Ending 23 Apr at 14:36 EDT4d 18hTop Rated SellerFrom ThailandMetal: Sterling SilverStyle: TennisLength: 7 - 7.49"
OTHER GEMS Rhodolite Garnet. October - Opal & Tourmaline November - Topaz & Citrine December - Tanzanite & Turquoise. PRODUCT TYPE Bangle. FACE BANGLE 65.0 X 13.0 MM. July - Ruby August - Peridot September - Sapphire. MAIN STONE Sapphire. PLATE 14k White Gold. FACE BRACELET 170.0 X 5.0 MM. PRODUCT TYPE Bracelet. MAIN STONE COLOR Top Rich Orange. MAIN STONE SHAPE Round Cut. TOTAL weight 71.72 ct (total weight of silver stone). Ending 23 Apr at 14:29 EDT4d 18hTop Rated SellerFrom ThailandMetal: Sterling SilverStyle: TennisLength: 8 - 8.49"
MAIN STONE Tourmaline. FACE BRACELET 185.0 X 4.0 MM. PRODUCT TYPE Bracelet. MAIN STONE SHAPE Round Cabochon. PLATE 14k Rose Gold. TOTAL weight 67.03 ct (total weight of silver stone). MAIN STONE COLOR Multi-Color. Ending 23 Apr at 13:48 EDT4d 17hTop Rated SellerFrom ThailandMetal: Sterling SilverStyle: TennisLength: 8 - 8.49"
OTHER GEMS Cubic Zirconia. PLATE 14k White Gold. CZ 1.0 TO 1.5 MM. FACE BRACELET 80.0 X 15.0 MM. MAIN STONE Pearl. PRODUCT TYPE Bracelet. MAIN STONE SHAPE Round button. TOTAL weight 30.78 ct (total weight of silver stone). Ending 23 Apr at 13:56 EDT4d 17hTop Rated SellerFrom ThailandMetal: Sterling SilverStyle: TennisLength: 8.5 - 8.99"
New ListingTiffany & Co Sterling Silver Germany Aztec Zig Zag Hematite Bead Bracelet 7 1/2"
Tiffany & Co Germany Aztec Hematite Bead Etched Zig Zag 7 1/2" Bracelet. Solid 925 Sterling Silver with Hematite Stones. Hallmarked Tiffany & Co 925 Germany. New ListingCarved Amethyst Gemstone Handmade .925 Silver Bracelet 7-8"
Clasp/Bail Spring Ring Clasp. Since its foundation, Bayam Jewelry has successfully showcased its quality products at international fairs and expanded in the industry with numbers of locations in and around Italy, New York, Las Vegas, Miami and Turkey. 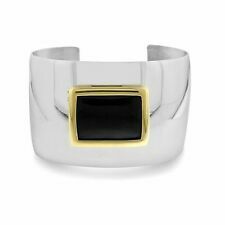 New ListingRussian Charoite Gemstone 925 Sterling Silver Jewelry Cuff Bracelet Adst. MAIN STONE Rhodolite Garnet. PRODUCT TYPE Bangle. FACE BANGLE 62.0 X 37.0 MM. PLATE 2-Tone White & Yellow 14k Gold. MAIN STONE SHAPE Round Cut. TOTAL weight 147.23 ct (total weight of silver stone). New ListingGolden Sunstone Gemstone Handmade 925 Sterling Silver Bracelet 6-9"
Main Stone : Golden Sunstone. Material : Gemstone. Main Stone Shape : As Seen In Picture. Main Stone Color : Multi Color. Main Stone Creation : Natural. David Yurman Ruby Double Station Bracelet in Sterling Silver and 14K Gold Condition is Pre-owned Pouch included!! We can manufacture Silver with Diamonds products as well as Silver-Lab Created Diamond products with equal ease. We turnaround 1,00,000 pcs annually. It is that simple! We will try our absolute best to resolve any problems that you may have. 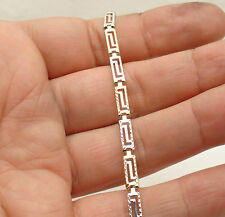 New Listing34 CT. STERLING 925 SILVER 3-TONE BRACELET LENGTH 7.75 INCH. VS GOOD QUALITY WITH VERY SLIGHT INCLUSIONS. CAN SEE BY NAKED EYE. BUT NO EFFECT TO THE BEAUTY. VVS HIGH QUALITY WITH VERY VERY SLIGHT INCLUSIONS THE INCLUSIONS ARE NOT VISIBLE TO THE NAKED EYE. IF EXCELLENT QUALITY FREE OF INTERNAL INCLUSIONS. Ending 23 Apr at 13:35 EDT4d 17hTop Rated SellerFrom ThailandMetal: Sterling SilverStyle: TennisLength: 7.5 - 7.99"
New ListingEnthralling Rose Quartz Gemstone 925 Silver Jewelry Cuff Bracelet Adst. New ListingFabulous Labradorite Gemstone 925 Sterling Silver Cuff Bracelet Adst. MAIN STONE Peridot. PLATE 14k Yellow Gold. MAIN STONE SHAPE Cushion Cut. PRODUCT TYPE Bracelet. FACE BRACELET 173.0 X 7.0 MM. MAIN STONE COLOR Top Rich Green. TOTAL weight 61.68 ct (total weight of silver stone). Ending 23 Apr at 13:02 EDT4d 16hTop Rated SellerFrom ThailandMetal: Sterling SilverStyle: TennisLength: 7.5 - 7.99"
Whether you are shopping for yourself or someone else, the massive inventory of fine bracelets on eBay makes it easy to find something to suit your tastes and budget. Gemstone bracelets make a wonderful birthday gift, especially if you choose the stones that match the birth month of the recipient. For January, pick something encrusted with glimmering garnet, for February, pick amethyst, and for March, choose aquamarine. Diamonds are a girl's best friend, especially if her birthday falls in April, while glorious green emeralds are for May. Pearls are for June babies, a red ruby is for July, peridot celebrates August births, September is the month of sapphire, and opal is for October. 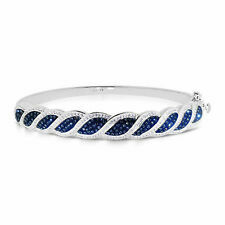 Topaz is the birthstone for November, and tanzanite is for December. Alternatively, simply choose a bracelet decorated with the gemstones that catch your eye. A plain precious metal bracelet is anything but ordinary. When you are making a choice, consider the type of metal carefully. Yellow gold is very traditional and also one of the most popular choices, along with white gold and trendy rose gold. Gold is relatively easy to keep clean, unlike sterling silver which tends to tarnish rapidly; however, some people enjoy the vintage patina of old silver jewellery. 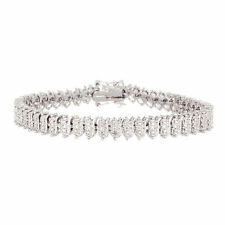 Platinum is a white metal that complements diamonds perfectly, but comes at a high price. 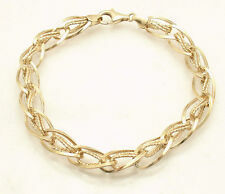 Sellers on eBay offer all kinds of bracelets, from inexpensive costume pieces to fine designer brands. Search for some of the biggest names in fashion accessories, including Cartier and Gucci. A Pandora bracelet is a keepsake that is sure to delight, while anything from Tiff & Co. is going to make the recipient feel special.